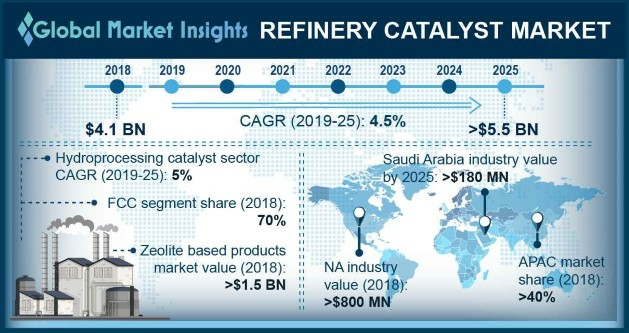 Refinery Catalysts Market size is likely to cross USD 5.5 billion by 2025; according to a new research report by Global Market Insights, Inc.
Refinery catalysts are used all over the refining sector to convert heavy crude oil to lighter derivatives. Tightening of the fuel quality standards including reduction of olefins, benzene, and other aromatics in gasoline, along with the global shift towards fuels with extremely low sulfur content will require refining industry to undertake significant upgradation. Petroleum refiners investing heavily for the upgradation and expansion of the refineries for meeting the emission norms and sulfur content regulations will have a positive impact on refinery catalysts market size in coming years. The product finds wide range of applications in many processes which include reforming, isomerization, catalytic cracking, desulfurization, etc. The rapid development of unorthodox oil reserves will further boost the growth of the global refinery catalysts market during the forecast period. The products provide most favorable butylene selectivity, improved metals tolerance ability and optimum selectivity & conversion on light feeds which will propel the growth of the product market in coming years. The key product variants include FCC (fluid catalytic cracking), alkylation, hydroprocessing, and reforming & isomerization. Among these product types, FCC segment will accumulate more than two-third of overall refinery catalysts market by the end of the forecast spell. These products are primarily used for breaking down heavy crude oils into lighter molecule hydrocarbons upon heating. On the basis of materials, the market is segmented into zeolite, chemical compound, metal and others. The metal-based segment is likely to have the market share of more than 30% of the total refinery catalysts market size by 2025. Vanadium, molybdenum, cobalt, nickel and other precious metals are preferably used as the metal based catalysts. These metals are vastly used in reforming and hydrotreating processes owing to their efficient eradication of impurities and reduction of hazardous & toxic gas emission into the atmosphere. In the Kingdom of Saudi Arabia, the refinery catalysts market will be worth more than USD 180 million by the end of 2025. The country has the second largest crude oil reserve in the world and is now shifting its focus towards the downstream petrochemicals sector, investing in development and expansion of the refineries. Steps such as expansion of the SATORP refinery (joint venture of Total and Saudi Aramco) in the country will prosper the regional product demand in near future. Major companies in refinery catalysts market include Albemarle, Honeywell UOP, Royal Dutch Shell, W. R. Grace & Co., Haldor Topsoe, Clariant, Axens, Johnson Matthey, and BASF. These companies focus on new product development to increase the refinery efficiency while following the strict environmental regulations.